Priced below KBB Fair Purchase Price! CARFAX One-Owner. Clean CARFAX. 2D Convertible, 6-Speed Automatic, ABS brakes, Electronic Stability Control, Heated door mirrors, Heated front seats, Heated Front Sport Seats, Illuminated entry, Low tire pressure warning, Remote keyless entry, Traction control. White 2016 Volkswagen Beetle 1.8T Denum FWD 6-Speed Automatic I4 We Offer the Best Automotive Finance and Loans for Good and Bad Credit "GUARANTEED APPROVAL". Odometer is 8773 miles below market average! 25/34 City/Highway MPG Let Carmel Motors show you how easy it is to buy a quality used car in Carmel. We can arrange shipping to anywhere in the country at our discounted rates. We believe fair prices, superior service, and treating customers right leads to satisfied repeat buyers. SERVING ALL SURROUNDING CITIES OF CARMEL, FISHERS, WESTFIELD, MCCORDSVILLE, FORTVILLE, NEW PALESTINE, NEW CASTLE, GREENFIELD, GREENWOOD, MUNCIE, YORKTOWN, MARION, GAS CITY, SPENCER, CICERO, KOKOMO, LAFAYETTE, COLUMBUS, NASHVILLE, BROWNSBURG, AVON, BLOOMINGTON, MARTINSVILLE, BEDFORD, JASPER, WASHINGTON, EVANSVILLE, VINCENNES, GARY, CROWN POINTE, SHELBYVILLE, MERRILLVILLE, CRAWFORDSVILLE, WEST LAFAYETTE, FT WAYNE, SOUTH BEND, ELKHART, HAMMOND, RICHMOND, CINCINNATI, LOUISVILLE, CHICAGO, NASHVILLE, TENNESSEE, EDINBURGH, TERRE HAUTE, SHERATON, MONTICELLO. 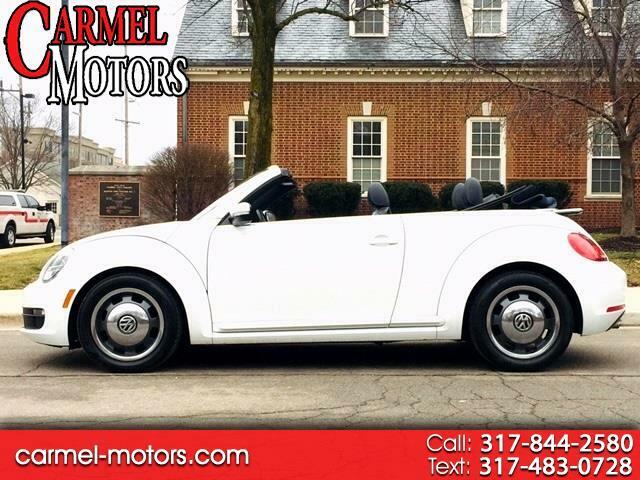 Message: Thought you might be interested in this 2016 Volkswagen Beetle Convertible.